This MAb is specific to lambda light chain of immunoglobulin and shows no cross-reaction with lambda light chain or any of the five heavy chains. In mammals, the two light chains in an antibody are always identical, with only one type of light chain, kappa or lambda. The ratio of Kappa to Lambda is 70:30. However, with the occurrence of multiple myeloma or other B-cell malignancies this ratio is disturbed. 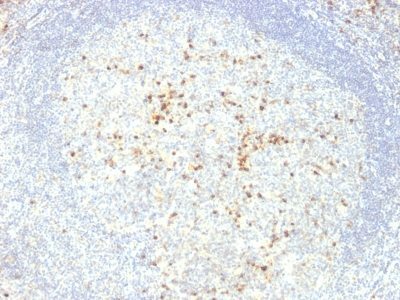 Antibody to the lambda light chain is reportedly useful in the identification of leukemias, plasmacytomas, and certain non-Hodgkin’s lymphomas. Demonstration of clonality in lymphoid infiltrates indicates that the infiltrate is malignant. 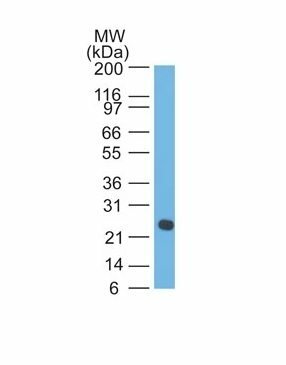 Catalog number key for antibody number 0735, Anti-Human Lambda Light Chain (LcN-2 ICO-106) The prefix indicates conjugation, followed by the antibody number and size suffix.